For other uses, see Bahrain (disambiguation). Bahrain (/bɑːˈreɪn/ ( listen); Arabic: البحرين‎ al-Baḥrayn Arabic pronunciation: [aɫ baħrajn] ( listen)), officially the Kingdom of Bahrain (Arabic: مملكة البحرين‎ Mamlakat al-Baḥrayn), is an island country in the Persian Gulf. 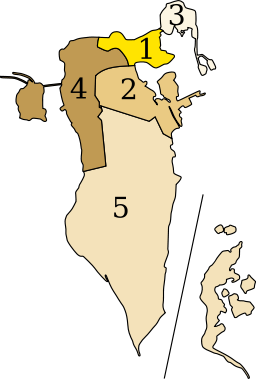 The sovereign state comprises a small archipelago centered around Bahrain Island, situated between the Qatar peninsula and the north eastern coast of Saudi Arabia, to which it is connected by the 25-kilometre (16 mi) King Fahd Causeway. Bahrain's population is 1,234,571 (c. 2010), including 666,172 non-nationals. It is 765.3 square kilometres (295.5 sq mi) in size, making it the third-smallest nation in Asia after the Maldives and Singapore. Map showing the locations of the ancient burial mounds. There are an estimated 350,000 burial mounds. The Persian Empire in Sassanid era at its peak during the reign of Khosrau II (590–628). After World War II, increasing anti-British sentiment spread throughout the Arab World and led to riots in Bahrain. The riots focused on the Jewish community. In 1948, following rising hostilities and looting, most members of Bahrain's Jewish community abandoned their properties and evacuated to Bombay, later settling in Israel (Pardes Hanna-Karkur) and the United Kingdom. As of 2008[update], 37 Jews remained in the country. In the 1950s, the National Union Committee, formed by reformists following sectarian clashes, demanded an elected popular assembly, removal of Belgrave and carried out a number of protests and general strikes. In 1965 a month-long uprising broke out after hundreds of workers at the Bahrain Petroleum Company were laid off. Inspired by the regional Arab Spring, Bahrain's Shia majority started large protests against its Sunni rulers in early 2011.:162–3 The government initially allowed protests following a pre-dawn raid on protesters camped in Pearl Roundabout. :73–4, 88 A month later it requested security assistance from Saudi Arabia and other Gulf Cooperation Council countries and declared a three-month state of emergency. :132–9 The government then launched a crackdown on the opposition that included conducting thousands of arrests and systematic torture. Almost daily clashes between protesters and security forces led to dozens of deaths. Protests, sometimes staged by opposition parties, were ongoing. More than 80 civilians and 13 policemen have been killed as of March 2014[update]. According to Physicians for Human Rights, 34 of these deaths were related to government usage of tear gas originally manufactured by U.S.-based Federal Laboratories. The lack of coverage by Arab media in the Persian Gulf, as compared to other Arab Spring uprisings, has sparked several controversies. Iran is alleged by United States and others to have a hand in the arming of Bahraini militants. 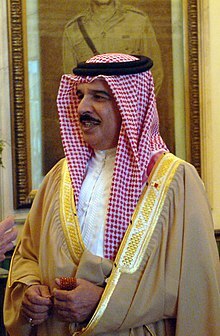 Bahrain under the Al-Khalifa is a constitutional monarchy headed by the King, Shaikh Hamad bin Isa Al Khalifa. King Hamad enjoys wide executive powers which include appointing the Prime Minister and his ministers, commanding the army, chairing the Higher Judicial Council, appointing the parliament's upper house and dissolving its elected lower house. (p15) The head of government is the unelected prime minister, Shaikh Khalīfa bin Salman Al Khalifa, the uncle of the current king who has served in this position since 1971, making him the longest-serving prime minister in the world. In 2010, about half of the government was composed of the Al Khalifa family. 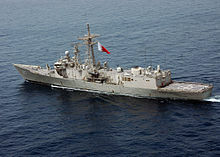 Bahrain is the headquarters of the U.S. Navy's Fifth Fleet responsible for naval forces in the Persian Gulf. Bahrain established bilateral relations with 190 countries worldwide. As of 2012[update], Bahrain maintains a network of 25 embassies, 3 consulates and 4 permanent missions to the Arab League, United Nations and European Union respectively. Bahrain also hosts 36 embassies. Bahrain plays a modest, moderating role in regional politics and adheres to the views of the Arab League on Middle East peace and Palestinian rights by supporting the two state solution. Bahrain is also one of the founding members of the Gulf Cooperation Council. Relations with Iran tend to be tense as a result of a failed coup in 1981 which Bahrain blames Iran for and occasional claims of Iranian sovereignty over Bahrain by ultra-conservative elements in the Iranian public. 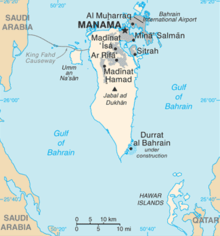 The United States designated Bahrain a major non-NATO ally in 2001. As of October 2014[update], Bahrain is ruled by an "authoritarian regime" and is rated as "Not Free" by the U.S.-based non-governmental Freedom House. Bahrain has been connected to the internet since 1995 with the country's domain suffix is '.bh'. The country's connectivity score (a statistic which measures both Internet access and fixed and mobile telephone lines) is 210.4 percent per person, while the regional average in Arab States of the Persian Gulf is 135.37 percent. The number of Bahraini internet users has risen from 40,000 in 2000 to 250,000 in 2008, or from 5.95 to 33 percent of the population. As of August 2013[update], the TRA has licensed 22 Internet Service Providers. At the beginning of the 20th century, Qur'anic schools (Kuttab) were the only form of education in Bahrain. They were traditional schools aimed at teaching children and youth the reading of the Qur'an. 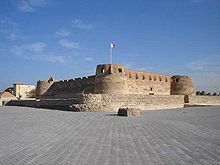 After World War I, Bahrain became open to western influences, and a demand for modern educational institutions appeared. 1919 marked the beginning of modern public school system in Bahrain when the Al-Hidaya Al-Khalifia School for boys opened in Muharraq. In 1926, the Education Committee opened the second public school for boys in Manama, and in 1928 the first public school for girls was opened in Muharraq. As of 2011[update], there are a total of 126,981 students studying in public schools. A wind tower in Bahrain. 1 January New Year's Day رأس السنة الميلادية The Gregorian New Year's Day. 1 May Labour Day يوم العمال Locally called "Eid Al Oumal" (Workers' Day). 16 December National Day اليوم الوطني National Day of Bahrain. 9th, 10th Muharram Day of Ashura عاشوراء Represented on the 9th and 10th day of the Hijri month of Muharram. Coincided with the memory of the martyrdom of Imam Hussein. 1st, 2nd, and 3rd Shawwal Little Feast عيد الفطر Commemorates the end of Ramadan. 9th Zulhijjah Arafat Day يوم عرفة Commemoration of Muhammad's final sermon and completion of the message of Islam. 10th, 11th, 12th, and 13th Zulhijjah Feast of the Sacrifice عيد الأضحى Commemorates Ibrahim's willingness to sacrifice his son. Also known as the Big Feast (celebrated from the 10th to 13th). 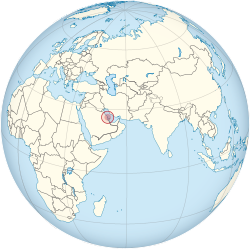 ^ a b c d e f "CIA World Factbook, "Bahrain"". Cia.gov. Archived from the original on 29 December 2010. Retrieved 25 January 2011. ^ "Bahraini Census 2010 – تعداد السكــان العام للبحريــن 2010". Archived from the original on 20 March 2012. Retrieved 31 January 2012. ^ a b c d e f "General Tables". Bahraini Census 2010. Archived from the original on 20 March 2012. Retrieved 3 March 2012. ^ Oman: The Lost Land Archived 6 October 2014 at the Wayback Machine. Saudi Aramco World. Retrieved on 7 November 2016. ^ CNN Wire Staff (1 November 2012). "Bahrain says ban on protests in response to rising violence". CNN. Retrieved 16 November 2012. ^ "How Bahrain uses sport to whitewash a legacy of torture and human rights abuses | David Conn | Sport". The Guardian. Retrieved 19 July 2018. ^ "PressTV-Bahrain king enacts election ban on opposition figures". Presstv.com. 12 June 2018. Retrieved 19 July 2018. ^ a b Houtsma, M. Th. (1960). "Baḥrayn". Encyclopedia of Islam. I. Leiden: E.J. Brill. p. 941. ^ Room, Adrian (2006). Placenames of the World: Origins and Meanings of the Names for 6,600 Countries, Cities, Territories, Natural Features, and Historic Sites. McFarland. ISBN 978-0-7864-2248-7. ^ First encyclopaedia of Islam 1913–1936. E.J. Brill. 1993. p. 584. ISBN 978-90-04-09796-4. ^ Rice, Michael (1994). The Archaeology of the Arabian Gulf, c. 5000–323 BC. Routledge. ISBN 0-415-03268-7. ^ "Dialect, Culture, and Society in Eastern Arabia: Glossary". Clive Holes. 2001. pp. XIX. 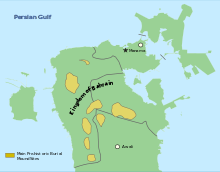 ^ "Qal'at al-Bahrain – Ancient Harbour and Capital of Dilmun". UNESCO. Retrieved 5 October 2012. ^ Larsen, Curtis E. (1984). Life and Land Use on the Bahrain Islands: The Geoarchaeology of an Ancient Society. University of Chicago Press. pp. 52–55. ISBN 978-0-226-46906-5. ^ a b Larsen 1983, p. 13. ^ R. A. Donkin. Beyond Price: Pearls and Pearl-fishing: Origins to the Age of Discoveries, Volume 224. p. 48. ^ Michael Rice. Bahrain Through The Ages – Archa. pp. 401–402. ^ Hoyland, Robert G. (2001). Arabia and the Arabs: From the Bronze Age to the Coming of Islam. Routledge. p. 28. ISBN 978-0-415-19535-5. ^ a b "Dialect, Culture, and Society in Eastern Arabia: Glossary". Clive Holes. 2001. pp. XXIV–XXVI. Thus the pre-Islamic ethno-linguistic situation in eastern Arabia appear to have been a mixed tribal population of partially Christianised Arabs of diverse origins who probably spoke different old Arabian vernaculars; a mobile Persian-speaking population, possibly of traders and administrators, with strong links to Persia, with which they maintained close contact; a sedentary, non-tribal community of Aramaic-speaking farmers; a Persian clergy, which we know for certain, used Syriac as a language of liturgy and general writing, probably alongside Persian as a spoken language. ^ a b J. R. Smart (2013). "Tradition and Modernity in Arabic Language And Literature". ^ "E.J. Brill's First Encyclopaedia of Islam, 1913–1936, Volume 5". M. Th. Houtsma. 1993. p. 98. ^ Serjeant, Robert Bertram (1968). "Fisher-folk and fish-traps in al-Bahrain". Bulletin of the School of Oriental and African Studies, University of London. 31 (3): 486–514 (488). doi:10.1017/s0041977x00125522. JSTOR 614301. ^ "The letters of the Prophet Muhammed beyond Arabia" (PDF). Archived from the original (PDF) on 6 December 2010. Retrieved 18 June 2012. ^ a b McCoy, Eric Andrew (2008). Iranians in Bahrain and the United Arab Emirates: Migration, Minorities, and Identities in the Persian Gulf Arab States. ProQuest. p. 73. ISBN 978-0-549-93507-0. ^ Slot, B. (1991). The Origins of Kuwait. BRILL. p. 110. ISBN 978-90-04-09409-3. ^ Wilkinson, John Craven (1991). Arabia's frontiers: the story of Britain's boundary drawing in the desert. I.B. Tauris. p. 44. ^ Rihani, Ameen Fares (1930). Around the coasts of Arabia. Houghton Mifflin Company. p. 297. 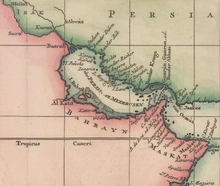 ^ "'Gazetteer of the Persian Gulf. Vol I. Historical. Part IA & IB. J G Lorimer. 1915'  (1155/1782)". qdl.qa. p. 1000. Retrieved 16 January 2015. ^ Al-Baharna, Husain (1968). Legal Status of the Arabian Gulf States: A Study of Their Treaty Relations and Their International Problems. Manchester University Press. p. 31. ISBN 0-7190-0332-6. ^ a b Smart, J. R.; Smith, G. Rex; Pridham, B. R. (2004). New Arabian Studies. University of Exeter Press. pp. 51, 52, 53, 67, 68. ISBN 978-0-85989-706-8. ^ Pridham, B. R.; University of Exeter. Centre for Arab Gulf Studies (1985). The Arab Gulf and the West. Taylor & Francis. p. 7. ISBN 978-0-7099-4011-1. ^ a b c Wilson, Arnold T. (2011). The Persian Gulf: A historical sketch from the earliest times to the beginning of the twentieth century. Routledge. ISBN 978-1-136-84105-7. ^ a b c Mojtahed-Zadeh & 1999, p. 130. ^ Kinninmont, Jane (28 February 2011). "Bahrain's Re-Reform Movement". Foreign Affairs. Retrieved 7 July 2012. ^ a b Abedin, Mahan (9 December 2004). "All at sea over 'the Gulf'". Asia Times Online. Retrieved 7 July 2012. ^ "Near & Middle East Titles: Bahrain Government Annual Reports 1924–1970". Cambridge Archives Editions. Archived from the original on 3 October 2012. Retrieved 2 October 2012. ^ "Bahrain Education". looklex.com. Archived from the original on 3 October 2012. Retrieved 17 June 2012. ^ "Bahrain:"How was separated from Iran" ?". Iran Chamber Society. Retrieved 17 June 2012. Based on extracts from Mojtahedzadeh, Piruz (1995). "Bahrain: the land of political movements". Rahavard, a Persian Journal of Iranian Studies. XI (39). ^ Yergin, Daniel (13 January 1991). "The Incessant Lure of Kuwait's Oil". The New York Times. Retrieved 5 October 2012. ^ Mulligan, William E. (July–August 1976). "Air Raid! A Sequel". Saudi Aramco World. Archived from the original on 3 October 2012. Retrieved 2 October 2012. ^ a b Hamza, Abdul Aziz (2009). Tears on an Island: A History of Disasters in the Kingdom of Bahrain. Al Waad. p. 165. ISBN 99901-92-22-7. ^ a b Ratzlav-Katz, Nissan (14 August 2008). "The King of Bahrain Wants the Jews Back". Israel National News. Archived from the original on 3 October 2012. Retrieved 2 October 2012. ^ a b Curtis, Adam (11 May 2012). "If you take my advice – I'd repress them". BBC News. Retrieved 27 June 2012. ^ The Middle East and North Africa 2004. Routledge. 2003. p. 225. ISBN 1-85743-184-7. ^ "Bahrain". National Post. Archived from the original on 6 October 2012. Retrieved 5 October 2012. ^ Talbott, Strobe (25 October 1982). "Gulf States: Stay Just on the Horizon, Please". Time. Archived from the original on 3 October 2012. Retrieved 2 October 2012. ^ Malik, Adnan (14 December 2002). "Bahrain's monarch opens parliament after a span of nearly 30 years". Associated Press (via HighBeam Research). Archived from the original on 4 October 2012. ^ a b "Bahrain: Promising human rights reform must continue" (PDF). Amnesty International. 13 March 2001. Retrieved 9 February 2011. ^ "Bahrain declares state of emergency after unrest". Reuters. 15 March 2011. Archived from the original on 3 October 2012. Retrieved 3 October 2012. ^ a b c d e "Report of the Bahrain Independent Commission of Inquiry". BICI. ^ Law, Bill (6 April 2011). "Police Brutality Turns Bahrain Into 'Island of Fear'". Crossing Continents (via BBC News). Retrieved 15 April 2011. ^ "Bahrain inquiry confirms rights abuses". Al Jazeera English. 23 November 2011. Archived from the original on 3 October 2012. Retrieved 19 June 2012. ^ "Applying pressure on Bahrain". The Washington Post. 10 May 2011. Archived from the original on 3 October 2012. Retrieved 7 July 2012. ^ Solomon, Erika (11 June 2011). 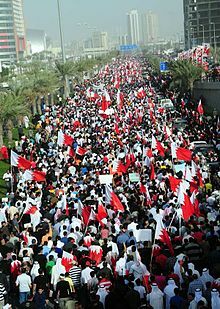 "Thousands rally for reform in Bahrain". Reuters. Archived from the original on 3 October 2012. ^ "Bahrain protesters join anti-government march in Manama". BBC News. 9 March 2012. Archived from the original on 3 October 2012. Retrieved 3 October 2012. ^ "Bahrain live blog 25 Jan 2012". Al Jazeera. 25 January 2012. Retrieved 17 February 2012. ^ "Bomb blast kills three Bahrain policemen". BBC. 3 March 2014. Retrieved 6 March 2014. ^ "Tear Gas or Lethal Gas? Bahrain's Death Toll Mounts to 34". Physicians for Human Rights. 6 March 2012. Retrieved 12 January 2018. ^ Bahrain Watch (31 July 2013). "UK's relations with Saudi Arabia and Bahrain (further written evidence)". Foreign Affairs Select Committee. Retrieved 12 January 2018. ^ Hammond, Andrew (14 April 2011). "Gulf media find their red line in uprisings:Bahrain". Reuters Africa. Retrieved 26 April 2013. ^ Mekhennet, Souad (1 April 2017). "U.S. increasingly sees Iran's hand in the arming of Bahraini militants". The Washington Post. Retrieved 19 July 2018. ^ "Bahrain Geography and Population". countrystudies.us. Archived from the original on 23 September 2006. Retrieved 29 June 2012. ^ a b c d "Bahrain". Britannica Online Encyclopedia. Retrieved 29 June 2012. ^ Kingdom of Bahrain National Report (PDF) (Report). International Hydrographic Organization. 2013. p. 1. Retrieved 11 June 2013. ^ Abdulla, Mohammed Ahmed; Zain al-'Abdeen, Bashir (2009). تاريخ البحرين الحديث (1500–2002) [Modern History of Bahrain (1500–2002)]. Bahrain: Historical Studies Centre, University of Bahrain. pp. 26, 29, 59. ISBN 978-99901-06-75-6. ^ a b The Report: Bahrain 2010. Oxford Business Group. pp. 12–25. ISBN 978-1-907065-22-4. ^ Alsharhan, A. S. (2001). Hydrogeology of an Arid Region: The Arabian Gulf and Adjoining Areas. Elsevier. pp. 188–190. ISBN 978-0-444-50225-4. ^ Martin-King, Philippa (June 2011). "Intelligent buildings". International Electrotechnical Commission. Retrieved 5 July 2012. ^ "Bahrain Weather". Bahrain Weather. Archived from the original on 3 October 2012. Retrieved 25 June 2012. ^ "World Weather Information Service – Bahrain/Manama". World Meteorological Organization. 23 July 2012. 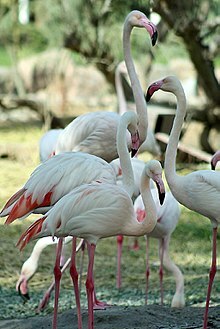 ^ a b c d e f g h Towards a Bahrain National Report to the Convention on Biological Diversity (PDF). Fuller & Associates. 2005. pp. 22, 23, 28. Archived from the original (PDF) on 17 January 2013. ^ a b "Country profile: Bahrain". Convention on Biological Diversity. Retrieved 24 June 2012. ^ "Bahrain Shia demand cabinet change". Al Jazeera English. 5 March 2010. Retrieved 4 July 2012. ^ "Bahrain". International Foundation for Electoral Systems. 26 July 2010. Retrieved 22 March 2011. ^ Bronner, Ethan (24 September 2011). "Bahrain Vote Erupts in Violence". The New York Times. Archived from the original on 24 September 2011. Retrieved 24 September 2011. ^ Krane, Jim (26 November 2006). "Islamists Dominate Bahrain Elections". Washington Post. Archived from the original on 3 October 2012. Retrieved 17 June 2012. ^ Jones, Sandy Russell (2007). "The Battle over Family Law in Bahrain". Middle East Report. 242: 33–39. JSTOR 25164777. ^ Hamada, Suad (5 June 2009). "Religion: New Family Law for Sunni Women in Bahrain Not for Shiites". Inter Press Service. Retrieved 5 July 2012. ^ Human Rights Without Frontiers (28 October 2011). Which Future For Bahrain? (PDF) (Report). International Center for Law and Religion Studies. pp. 8–9. Retrieved 5 July 2012. ^ MacLeod, Scott (14 May 2006). "Ghada Jamsheer: Activist". Time. Retrieved 5 July 2012. ^ a b Jamsheer, Ghada (18 December 2006). "Women in Bahrain and the Struggle Against Artificial Reforms". Women Living Under Muslim Laws. Retrieved 5 July 2012. ^ "Islamist Terrorism and Democracy in the Middle East". The New Republic. Retrieved 17 June 2012. ^ "Country Reports on Human Rights Practices". United States Department of State. 4 March 2002. Retrieved 5 July 2012. ^ "World Report 2011: Bahrain". Human Rights Watch. 2011. Retrieved 5 October 2012. ^ "Freedom in Bahrain 2011". Freedom House. 2011. Retrieved 29 January 2012. ^ Freedom of the Net 2011 – Bahrain part (PDF) (Report). Freedom House. 2011. ^ "RWB Press Freedom Index 2002". Reporters Without Borders. 2002. Retrieved 29 January 2012. ^ "RWB Press Freedom Index 2010". Reporters Without Borders. 2010. Retrieved 29 January 2012. ^ "FH Press Freedom Index 2011". Freedom House. 2011. Retrieved 29 January 2012. ^ Elizabeth Dickinson (23 November 2011). "Bahrain commission issues brutal critique of Arab Spring crackdown". The Christian Science Monitor. Retrieved 5 July 2012. ^ Payne, Ed (17 April 2012). "Amnesty report: Bahrain reforms are 'flawed,' 'inadequate'". CNN. Retrieved 7 July 2012. ^ Gordts, Eline (5 August 2011). "Shouting In The Dark: Al Jazeera Bahrain Documentary Shows The Bloody Fight For Democracy". The Huffington Post. Retrieved 15 August 2011. ^ AJStream (8 August 2011). "The Stream – Bahrain Foreign Minister Criticizes Al Jazeera Documentary on Twitter". Retrieved 15 August 2011. ^ "Saudi Arabia, UAE and Bahrain end rift with Qatar, return ambassadors". Reuters. 16 November 2014. Retrieved 16 November 2014. ^ European Parliament adopts resolution condemning Bahrain's human rights abuses. Indexoncensorship.org. Retrieved on 7 November 2016. ^ "Bahrain must stop discriminating against Shias: Tillerson". Shiite News. Retrieved 18 August 2017. ^ "Bahrain must stop discriminating against Shias: Tillerson". Muslim Times. Muslim Times. Retrieved 18 August 2017. ^ The New Arab (5 December 2014). "US approves huge arms sale to Bahrain despite human rights concer". Alaraby.co.uk. Retrieved 19 July 2018. ^ "Document | Amnesty International". Amnesty.org. 7 September 2017. Retrieved 19 July 2018. ^ "Bahrain: Government expels citizens after having revoked their nationality | Amnesty International". Amnesty.org. Retrieved 19 July 2018. ^ "Bahrain". Freedom House. Retrieved 19 July 2018. ^ "Bahrain Activist Gets 5-Year Sentence for 'Insulting' Tweets". The New York Times. 21 February 2018. ^ "Britain Trained a Bahraini Police Chief Who Presided Over Abuse of Political Dissidents - VICE". www.vice.com. ^ Ungoed-Thomas, Jon (5 February 2017). "Britain helps train 'violent' Bahraini police" – via www.thetimes.co.uk. the fund was used to pay for Bahrain's chief of police, Tariq al-Hassan, and other senior officers to travel to Belfast to learn how police in Northern Ireland deal with public protests. ^ MacFarquhar, Neil (22 May 2002). "In Bahrain, Women Run, Women Vote, Women Lose". The New York Times. Retrieved 7 July 2012. ^ Darwish, Adel (26 October 2002). "Islamists gain majority in Bahrain". The Telegraph. London. Retrieved 5 October 2012. ^ Toumi, Habib (27 November 2006). "Women fail to add to the seat won unopposed". Gulf News. Retrieved 4 July 2012. ^ Toumi, Habib (8 October 2011). "Bahrain women MPs set to make a difference as parliament reconvenes". Gulf News. Retrieved 4 July 2012. ^ "Bahrain names Jewish ambassador". BBC News. 29 May 2008. Retrieved 4 July 2012. ^ Toumi, Habib (27 May 2012). "Bahrain urges greater global religious tolerance". Gulf News. Retrieved 4 July 2012. ^ a b c "Bahrain profile". BBC News. 29 January 2013. ^ "Bahrain profile – Media". BBC News. Retrieved 15 June 2014. ^ "Crown Prince Biography". Ministry of Foreign Affairs, Bahrain. Retrieved 27 June 2012. ^ "HRH Prince Salman Exchanges Letters With BDF Chief Commander". Bahrain News Agency. 4 June 2011. Retrieved 6 October 2012. ^ Singh Singh, Ravi Shekhar (2005). Asian Strategic And Military Perspective. Lancer Publishers. p. 368. ISBN 978-81-7062-245-1. ^ "USS Jack Williams (FFG 24)". Navsource Online. Retrieved 4 October 2012. ^ "NSA Bahrain History". Naval Support Activity Bahrain. Retrieved 4 October 2012. ^ "U.S. Hypocrisy on Parade: Washington Arms Bahrain, Denounces Russia For Arming Syria". Forbes. 18 June 2013. ^ "Welcome to Naval Support Activity Bahrain". Commander, Navy Installations Command. Archived from the original on 6 October 2012. Retrieved 5 October 2012. ^ "Yemen crisis: Who is fighting whom?". 28 March 2017 – via www.bbc.com. ^ "Airstrike Hits Doctors Without Borders Hospital in Yemen". ^ "Yemen conflict: MSF hospital destroyed by air strikes". 27 October 2015 – via www.bbc.com. ^ "UK opens Persian Gulf military base in Bahrain". The Washington Post. 5 April 2018. ^ "Bilateral Relations". Ministry of Foreign Affairs, Bahrain. Retrieved 27 June 2012. ^ "Ministry of Foreign Affairs, Bahrain". Retrieved 27 June 2012. ^ "Palestine Peace Process". Ministry of Foreign Affairs, Bahrain. Retrieved 27 June 2012. ^ "Member States of the GCC". GCC. Archived from the original on 16 July 2012. Retrieved 27 June 2012. ^ "A Bahraini Hunger Strike And An Inhumane Argument Read more: A Bahraini Hunger Strike And An Inhumane Argument". NYU Local. 13 April 2012. Retrieved 27 June 2012. ^ "Bahrain slams Iran's claims, suspends gas deal talks". Xinhua News Agency. 20 February 2009. Archived from the original on 3 October 2012. Retrieved 27 June 2012. ^ a b c d "History of Municipalities". Ministry of Municipalities Affairs and Urban Planning – Kingdom of Bahrain. Archived from the original on 13 December 2012. Retrieved 5 July 2012. 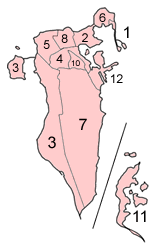 ^ a b "Governorates of Bahrain". Statoids. Retrieved 5 July 2012. ^ "Bahrain Government". Permanent Mission of the Kingdom of Bahrain to the United Nations. Archived from the original on 3 June 2012. Retrieved 5 July 2012. ^ "Three Polls, Three Different Approaches". The Estimate. 17 May 2002. Archived from the original on 3 October 2012. Retrieved 5 July 2012. ^ "Decree No.17 for 2002" (PDF). Capital Governorate. Archived (PDF) from the original on 3 October 2012. Retrieved 24 June 2012. ^ "Gulf Daily News » Local News » Central Governorate dissolved". ^ "Bahrain Becomes a 'Major Non-NATO Ally'". Voice of America. 26 October 2001. Retrieved 24 June 2012. ^ "Freedom House. Bahrain". freedomhouse.org. Retrieved 13 October 2014. ^ "Bahrain fully stocked for Eid al-Adha: official". Al Shorfa. 3 November 2011. Retrieved 3 October 2012. ^ a b "Bahrain food import bill to zoom 128pc". Daily Tribune. 9 November 2011. Archived from the original on 17 January 2013. Retrieved 3 October 2012. ^ "Bahrain profile: Timeline". BBC News. 3 October 2012. Archived from the original on 6 October 2012. Retrieved 5 October 2012. ^ Dokoupil, Martin (21 March 2012). "Bahrain economy slows to 1.3 pct q/q growth in Q4". Reuters. Retrieved 29 June 2012. ^ "Local News » JOBLESS RATE 3.8PC". Gulf Daily News. 4 August 2008. Retrieved 27 June 2010. ^ "Khaleej Times Online – 85pc unemployed in Bahrain are females". Khaleejtimes.com. 4 August 2008. Retrieved 27 June 2010. ^ "Tourism sector performance" (PDF). Economic Development Board – Bahrain. Archived from the original (PDF) on 12 August 2011. Retrieved 17 June 2012. ^ "Popular Attractions". Bahrain Guide. Retrieved 5 October 2012. ^ "Tree of Life, Bahrain". Wondermondo. Archived from the original on 3 October 2012. Retrieved 25 June 2012. ^ "Tourism". Bahraini Ministry of Foreign Affairs. Retrieved 25 June 2012. ^ CNN, Francesca Street (2019-01-23). "Underwater theme park opening in Bahrain". CNN Travel. Retrieved 2019-01-23. ^ https://plus.google.com/+travelandleisure/posts. "The World's Largest Underwater Theme Park Is Coming to Bahrain". Travel + Leisure. Retrieved 2019-01-25. ^ "Bahrain's 'Spring of Culture Festival' opens". TradeArabia. Retrieved 25 June 2012. ^ "Bahrain Spring of Culture 2012". TimeOutBahrain. Retrieved 25 June 2012. ^ "Traffic Statistics: December 2010" (PDF). Civil Aviations Affairs, Bahrain. Archived from the original (PDF) on 17 January 2013. Retrieved 5 July 2012. ^ a b c Elsheshtawy, Yasser (2008). The evolving Arab city: tradition, modernity and urban development. Routledge. p. 198. ISBN 978-1-134-12821-1. ^ Al A'Ali, Mohammed (18 March 2012). "Seaview blow for Manama". Gulf Daily News. Archived from the original on 4 October 2012. Retrieved 3 October 2012. ^ "Passenger Statistics". King Fahd Causeway Authority. Archived from the original on 17 January 2013. Retrieved 25 June 2012. ^ "Logistics and Infrastructure". Bahrain Economic Development Board. Archived from the original on 24 June 2012. Retrieved 4 July 2012. ^ "Bahrain – Transportation". Encyclopedia of the Nations. Archived from the original on 22 June 2006. Retrieved 5 July 2012. ^ "Getting around Bahrain". Lonely Planet. Retrieved 5 July 2012. ^ a b Group, Oxford Business (2008). Report: Bahrain 2008. p. 153. ISBN 9781902339979. ^ "VIVA subscribers surge". Gulf Daily News. Retrieved 4 July 2012. ^ "Arab Advisors Group reveals Bahrain's communications connectivity leading the region (press release)". AMEinfo. 5 August 2008. Archived from the original on 7 June 2011. Retrieved 12 September 2011. ^ "ITU Internet Indicators 2000". International Telecommunications Union. Retrieved 12 September 2011. ^ "ITU Internet Indicators 2008". International Telecommunications Union. Retrieved 12 September 2011. ^ "Market Information – No. of Licenses Issued". Telecommunication Regulatory Authority (Kingdom of Bahrain). Archived from the original on 15 May 2013. Retrieved 29 August 2013. ^ Salacanin, S. (February 2015). "Oil and gas reserves: how long will they last?". Bq Magazine. ^ a b c d e f g h i j k l UNESCO Science Report (PDF). Paris: UNESCO. 2015. ISBN 978-92-3-100129-1. ^ "Bahrain's population crossed 1m in December". Gulfnews.com. 28 February 2008. Retrieved 3 June 2012. ^ "290,000 Indians in Bahrain". Gulf-daily-news.com. 5 July 2008. Retrieved 27 June 2010. ^ "Indian Community". Indian Embassy. Archived from the original on 7 March 2012. Retrieved 6 March 2012. 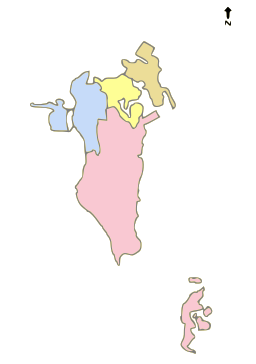 ^ "Bahrain: metropolitan areas". World Gazetteer. ^ "Two ethnicities, three generations: Phonological variation and change in Kuwait" (PDF). Newcastle University. 2010. p. 11. ^ "Bahrain's Rainbow Nation in Manama". HotelTravel.com. Archived from the original on 27 February 2014. Retrieved 20 February 2014. ^ a b "Sunnis and Shia in the Middle East". Mapping the Global Muslim Population. BBC News. December 19, 2013. ^ a b c David Pollock (November 20, 2017). "Sunnis and Shia in Bahrain: New Survey Shows Both Conflict and Consensus". Fikra Forum. Washington Institute for Near East Policy. ^ Andrew England (October 3, 2018). "Shia complain of exclusion from Bahrain's political process". Financial Times. ^ Andrew England & Simeon Kerr (October 1, 2018). "Bahrain's Shia loath to give Sunni rulers election credibility". Financial Times. ^ "An unfair election in Bahrain will not satisfy the Shia majority". Economist. November 22, 2018. ^ Chana Ya'ar (28 November 2010). "King of Bahrain Appoints Jewish Woman to Parliament". Arutz Sheva. Retrieved 28 November 2010. ^ Habib Toumi (4 April 2007). "Bahrain defends contacts with US Jewish body". gulfnews.com. ^ Kettani, Houssain (June 2010). "Muslim Population in Asia 1950–2020" (PDF). International Journal of Environmental Science and Development. 1 (2): 143–144. doi:10.7763/IJESD.2010.V1.28. Retrieved 25 June 2012. ^ "Roundup on status of Baha'is in Muslim-majority countries". The Muslim Network for Baha'i Rights. Retrieved 26 August 2013. ^ a b c "Bahrain: Languages". Britannica Online. Retrieved 28 June 2012. 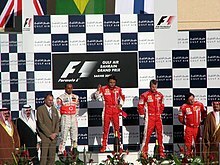 ^ "Bahrain 2002 (rev. 2012)". Constitute. Retrieved 17 March 2015. ^ "Living in Bahrain". BSB. Archived from the original on 24 June 2012. Retrieved 28 June 2012. ^ "Bahrain's Education System". Ministry of Foreign Affairs. Retrieved 17 June 2012. ^ "Education in Bahrain". Ministry of Education Bahrain. Archived from the original on 17 January 2013. Retrieved 28 June 2012. ^ a b c "History of Education in Bahrain". Ministry of Education, Bahrain. Archived from the original on 18 January 2013. Retrieved 28 June 2012. ^ "Statistics for the academic year 2011/2012" (PDF). Ministry of Education, Bahrain. Retrieved 28 June 2012. ^ "King Hamad's Schools of Future project" (PDF). Ministry of Education, Bahrain. Archived from the original (PDF) on 16 September 2012. Retrieved 28 June 2012. ^ "Education". Ministry of Foreign Affairs, Bahrain. Retrieved 28 June 2012. ^ "Management Consultancy Group – Bahrain". InfoBahrain. Retrieved 17 June 2012. ^ "Health Care Financing and Expenditure" (PDF). WHO. Archived from the original (PDF) on 17 January 2013. Retrieved 26 June 2012. ^ "Healthcare in the Kingdom of Bahrain" (PDF). Ministry of Health, Bahrain. Archived from the original (PDF) on 27 February 2012. Retrieved 26 June 2012. ^ "Bahrain Society". American Bahraini Friendship Society. Archived from the original on 3 October 2012. Retrieved 26 June 2012. ^ "SMC admissions" (PDF). Ministry of Health, Bahrain. Archived from the original (PDF) on 11 October 2010. Retrieved 26 June 2012. ^ a b c "Combatting HIV/AIDS and other diseases in Bahrain" (PDF). United Nations Development Program. Archived from the original (PDF) on 17 January 2013. Retrieved 26 June 2012. ^ "Immunization Profile – Bahrain". World Health Organisation. Retrieved 26 June 2012. ^ "Country Profile- Bahrain" (PDF). WHO. Retrieved 26 June 2012. ^ "Diabetes in Bahrain". TimeOut Bahrain. Retrieved 26 June 2012. ^ "Noncommunicable diseases in Bahrain" (PDF). World Health Organisation. Retrieved 26 June 2012. ^ "Features of sickle-cell disease in Bahrain". Gulf Genetic Centre. Archived from the original on 13 September 2012. Retrieved 26 June 2012. ^ "Ambassador Nonoo highlights religious freedom in Bahrain". Diplonews. Archived from the original on 17 January 2013. Retrieved 17 June 2012. ^ "Meet the new GMA child wonder | Showbiz Portal". www.showbiz-portal.com. Retrieved 28 February 2016. ^ "2013 State Sponsored Homophobia Report" (PDF). International Lesbian, Gay, Bisexual, Trans and Intersex Association. p. 20. Archived from the original (PDF) on 19 July 2013. Retrieved 8 August 2013. ^ "Two Bahraini men jailed for dressing in drag". ^ Toumi, Habib. (5 February 2011) Bahrain arrests scores in raid on gay party. GulfNews.com. Retrieved on 7 November 2016. ^ a b c Bloom, Jonathan M. (2009). The Grove Encyclopedia of Islamic Art and Architecture, Volume 2. Oxford University Press. p. 253. ISBN 0-19-530991-X. ^ Fattouh, Mayssa. "Bahrain's Art and Culture Scenes". Nafas. Retrieved 22 July 2012. ^ Aldosari, Ali (2006). Middle East, Western Asia, and Northern Africa. Marshall Cavendish Corporation. p. 39. ISBN 9780761475712. ^ "Bahrain – The Arts and the Humanities". EveryCulture.com. Retrieved 21 August 2012. ^ al-Jayousi, Mohammed (7 February 2011). "Bahraini poet Ali al-Sharqawi looks to explore 'cosmic spirit' in his works". Al Shorfa. Archived from the original on 3 October 2012. Retrieved 21 August 2012. ^ Lewis, Paul (18 November 1984). "Eden on the isle of Bahrain". New York Times. Archived from the original on 3 October 2012. Retrieved 21 August 2012. ^ Meixler, Louis (20 September 1998). "An Ancient Garden of Eden Is Unearthed in Persian Gulf's Bahrain". Los Angeles Times. Archived from the original on 3 October 2012. Retrieved 21 August 2012. ^ a b Frishkopf, Michael (2010). Music and Media in the Arab World. American University in Cairo. pp. 114–116. ISBN 977-416-293-5. ^ "IMMAF confirms officials from 11 different countries for 2017 Brave International Combat Week". Mymmanews.com. 11 September 2017. Retrieved 19 July 2018. ^ "Other Sports: Bahrain top venue for MMA training". Gdnonline.com. 27 August 2017. Retrieved 19 July 2018. ^ "Cricket: KHK Sports to launch Bahrain Premier League". Gdnonline.com. 6 December 2017. Retrieved 19 July 2018. ^ "KHK Sports set to launch Bahrain Premier League for T20 Cricket | THE DAILY TRIBUNE | KINGDOM OF BAHRAIN". Newsofbahrain.com. 6 December 2017. Retrieved 19 July 2018. ^ a b "Bahrain – Sports and Recreation". Britannica Online Encyclopedia. Retrieved 3 October 2012. ^ "Bahrain Football Association" (in Arabic). Bahrainfootball.org. Archived from the original on 17 July 2012. Retrieved 27 June 2012. ^ "Who is really behind the Bahrain-Merida team? - Cycling Weekly". Cycling Weekly. 19 September 2016. Retrieved 10 August 2017. ^ "BAHRAIN - MERIDA - Teams". Tour de France 2017. Archived from the original on 10 August 2017. Retrieved 10 August 2017. ^ Duane Finley (20 August 2015). "The Fighting Life: The Rise of MMA in Bahrain". Bleacher Report. Retrieved 23 March 2017. ^ "Brave To Host 9 Events in Middle East in 2017; UAE to Have An Edition in March". ArabsMMA. 20 June 2014. Retrieved 23 March 2017. ^ "Bahrain News Agency | Bahrain to host IMMAF World Championships of Amateur MMA". Bna.bh. 31 January 2017. Retrieved 19 July 2018. ^ Noble, Jonatha (17 February 2011). "Bahrain GP2 Asia race cancelled". Autosport. Retrieved 25 March 2012. ^ Pleitgen, Frederik (18 April 2012). "Bahrain circuit boss: Race not a big risk". CNN. Retrieved 21 April 2012. ^ "Press Release: FIA Formula One World Championship – Bahrain Grang Prix". FIA.com. Fédération Internationale de l'Automobile. 13 April 2012. Archived from the original on 14 April 2012. Retrieved 13 April 2012. ^ "Clashes in Bahrain ahead of F1 race". Al Jazeera. 20 April 2012. Retrieved 21 April 2012. ^ Pleitgen, Frederik (18 April 2012). "Bahrain circuit boss: Race not a big risk". CNN. Retrieved 30 June 2012. ^ News Wires (21 April 2012). "Bahrain security, protesters clash ahead of Grand Prix". France 24. AFP. Retrieved 30 June 2012. ^ "Protests As Anger Over Bahrain F1 Race Grows". Sky News Online. 20 April 2012. Archived from the original on 23 April 2012. Retrieved 21 April 2012. ^ Taylor, Jerome; Tremayne, David (21 April 2012). "Rage against the Formula One machine". The Independent. London. Retrieved 21 April 2012. ^ "BIC: Drag Racing". bahraingp.com. Archived from the original on 17 January 2013. Retrieved 17 June 2012. ^ Joyce, M. (2012). Bahrain from the Twentieth Century to the Arab Spring. Springer. p. 52. ISBN 9781137031792. Cole, Juan R. I. (1987). "Rival Empires of Trade and Imami Shiism in Eastern Arabia, 1300–1800". International Journal of Middle East Studies. 19 (2): 177–203. doi:10.1017/s0020743800031834. JSTOR 163353.